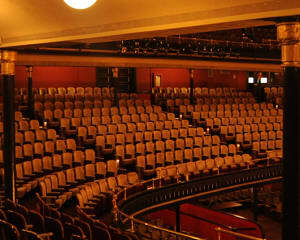 For Canadian music fans, Massey Hall is synonymous with music and sound. Revered for its acoustics and loved by musicians, Massey Hall has been home to an amazing list of iconic performances over the last 125 years. But what of the sounds of the hall itself? Footsteps upon the stage, the sound of sitting down in the seats, the rolling up of the ticket window? The Revitalization (link?) will improve upon many things, but may change some of these sounds forever. As R. Murray Schafer suggested in much of his work, preserving sound can teach us a great deal about our surroundings, history, potential futures, and ourselves. Knowing this, a team of sound engineers, percussionists, and educators walked through the Hall and captured recordings as they went. Backstage, on stage, from the deepest corners of the hall and up to the roof, the team worked to preserve the sounds of Massey Hall. They sat, tapped, slammed, squeaked, moved, poured, opened, closed, and rolled. These sounds are what are saved in our Sound Museum. There are now over 100 sounds preserved here to be listened to and interacted with. Use them to remember the original sounds of Massey Hall, then try to re-mix, design soundwalks, create beats, construct atmospheres, and otherwise just make music! Once you’re done, send us your remixes so we can include them as part of the museum. Send your creations to education@mh-rth.com. We hope you enjoy your visit to the Massey Hall Sound Museum! Special thanks to all of those who helped make the Massey Hall Sound Museum possible: Douglas Friesen, Joseph Shabason, Roger Leavens, Boombox Sound, Germaine Liu, Phillippe Melanson, and all of those at Massey Hall who submitted their favourite sounds or stopped by to help us capture the magic.